Lincoln, part of the Manitowoc Foodservice family, has it's manufacturing base in Cleveland, Ohio. Lincoln designs, manufactures, and markets commercial foodservice cooking equipment, serving systems, and utensils. Lincoln is one of the largest manufacturers of conveyor ovens and other cooking equipment and is the nation's largest manufacturer of commercial and institutional aluminum foodservice supplies. Lincoln is known best for its line of forced hot-air conveyor ovens called Impinger ovens. Impinger ovens cook most foods approximately two times faster than standard convection ovens and two to four times faster than conventional deck ovens. The Impinger ovens come in various capacities and space requirements. Lincoln was recognized Best In Class - 2014 in the Conveyor Ovens category. 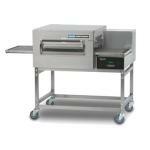 Restaurant Equipment Solutions carries the full Lincoln line of conveyor ovens, both gas and electric.